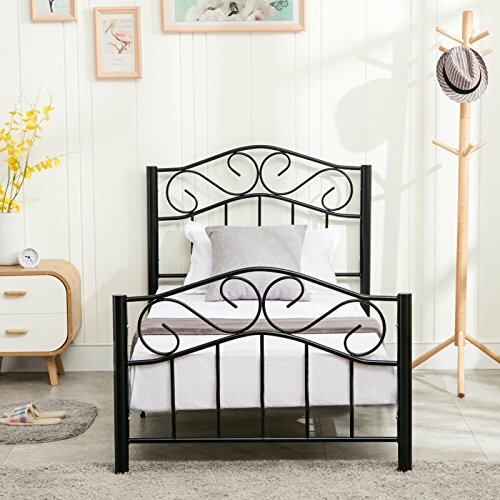 Bring a touch of elegance to your bedroom with this classic twin size metal bed frame in a fresh black/white finish. Design with pretty scroll inside the headboard and footboard gives that extra bit of style when walking into your bedroom. Plus, constructed from sturdy and thicken metal tube with strong metal slats along the base for firm mattress support to dress up in your home. Such an amazing premium quality and great value for money bed, just take it to your home without any hesitation! INCLUDE-Includes headboard ,footboard,metal rails,slats and support legs. Enough Storage space under the bed frame , easy to assemble , all accessories are included. UNIQUE DESIGN - Countryside or farmhouse style,elegant curved design on both foot & headboard, with center motifs and refined quality. STURDY METAL FRAME - Metal structure provides a strong support for your standard twin size spring,memory foam or latex mattresses,prevents it from sagging. NO BOX SPRING REQUIRED - Mattress can be put on the slates directly,no box spring needed. STORAGE SPACE - The distance is 9.84" from the floor,there is enough space to storage,you can have a tidy home.